This is “Not your Grandma’s Chicken Salad” since we’re replacing the often-used mayo with delicious, creamy avocado. 1 ripe avocado, peeled and cubed. 1. Add cubed avocado to a medium sized bowl and mash until creamy. Add lemon juice. Fold in shredded chicken and Lime Black Bean Fiesta Salad. Combine until well mixed. 1. 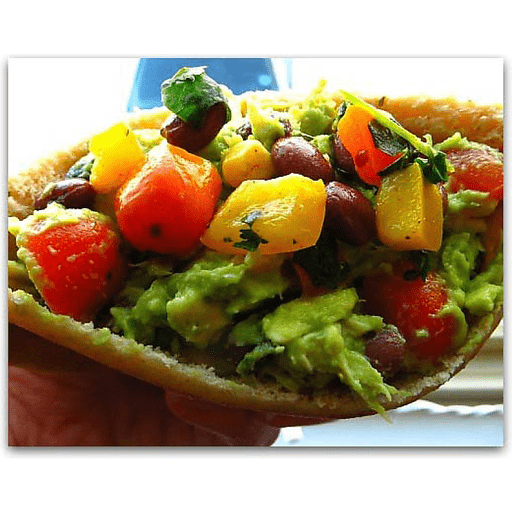 Use as a filling inside whole grain pita pockets or layer between slices of whole grain bread. For gluten free: Use gluten free flatbread or bread in place of Pocket Thins. Calories 370, Total Fat 11g (Saturated 1.5g, Trans 0g), Cholesterol 30mg, Sodium 490mg, Total Carbohydrate 47g (Dietary Fiber 5g, Sugars 5g, Includes 1g Added Sugars), Protein 20g, Vitamin D 0%, Calcium 6%, Iron 15%, Potassium 8% *Nutritional values are an approximation. Actual nutritional values may vary due to preparation techniques, variations related to suppliers, regional and seasonal differences, or rounding.